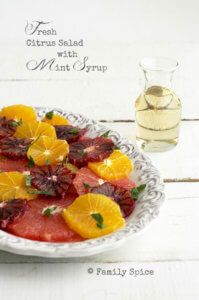 Fight off the cold and flu season armed with this beautiful Fresh Citrus Salad with Mint Syrup (Sekanjabin). I swear my family is lightning rod for germs this year. Since Thanksgiving, all three of my kids have passed around a bad cold 4 times. I’m sure my school district must think I have no respect for school when they look at our absences, but luckily I’ve kept the kiddos in line and crack the whip when it comes to their makeup work. Even still, it’s like I there’s a Craigslist ad out there for germs: Looking for a good home and warm host bodies to infect? Come on over! My blessed angels even got me sick. That darn cold kept me in bed for 4 days and took another 10 days before I felt somewhat normal. Hubby got the job done being backup mom, but he definitely doesn’t get the job with the same finesse as I have. I am slowly returning to blogging and I am busy catching up on my to-do list. Restocking the fridge with fresh produce was my first priority. It’s a good thing cold and flu season coincides with citrus season. 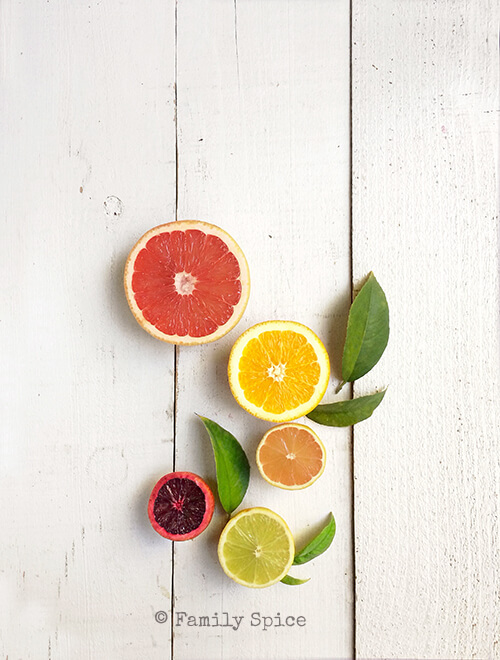 Grapefruits, oranges, blood oranges, tangerines, lemons and limes – oh, my! These beauties are rich in antioxidants and high in vitamin C, which not only boosts the immune system, but also helps your body absorb iron. Citrus is also a great source of fiber. This citrus salad is a great pick-me-up when your immune system is down and out of sorts. Add some fresh mint, a little drizzle of Sekanjabin (Persian Mint Syrup) and you are done. 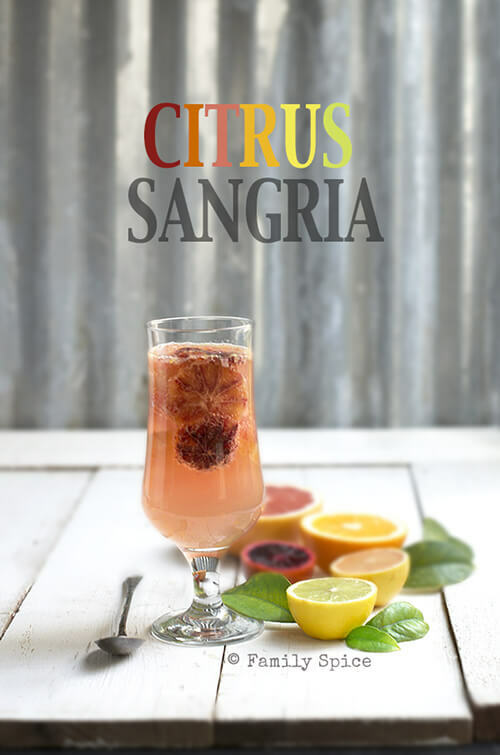 Then again, if you aren’t into salads, you can always use that fruit for some Citrus Sangria. Using a sharp knife, cut the ends of the fruit. Turn the fruit onto the cut side, and carefully cut the peel off each fruit. Once peeled, cut fruit into rings. Serving Suggestions: You can also substitute the mint syrup with honey. 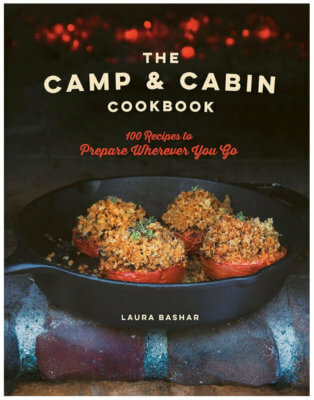 For a bit of crunch, garnish with chopped pistachios. Well, by now the family antibody count should be pretty high: sorry you have had to do it the hard way! Lovely salad tho’ have never heard of the particular mint syrup, so honey would have to fill in 🙂 ! So much better for you than a citrus drink which leaves you with too much sugar and too little fibre to act as an intestinal broom!! That is so pretty but I bet it tastes SO fresh! All this citrus certainly should help that bug that’s getting passed around. 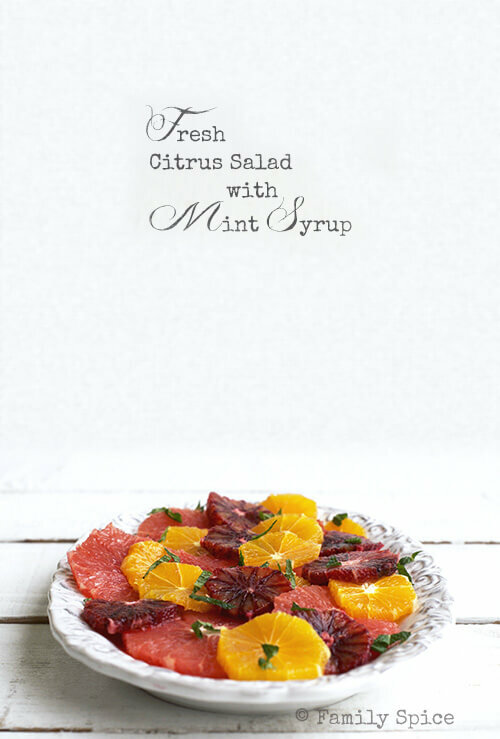 Love this time of year for wonderful citrus salads like this one. So simple, but yet so delicious!